This organ was restored in 2008-9, with Nicholas Thistlethwaite as advisor, with Nigel Howard as manager of the project for the church and with generous funding from the Heritage Lottery Fund. It was made by Thomas Elliot in 1819 for the Chapel Royal at St James’s Palace, Westminster. It was removed in 1837 and moved to Milverton near Leamington Spa, possibly by train since Milverton was then the terminal station for Leamington. 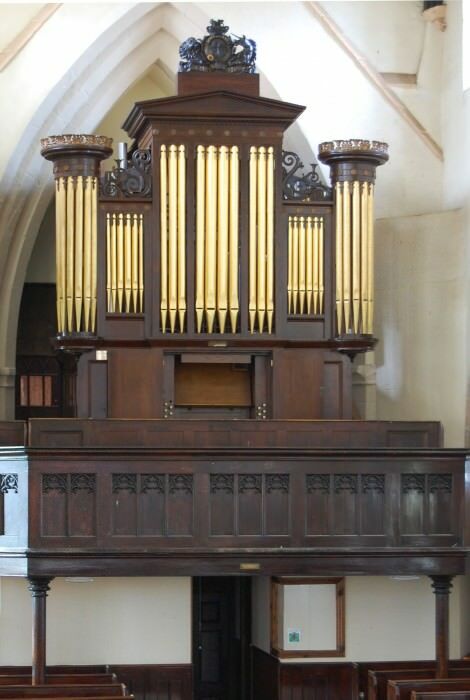 It was installed at Crick in 1841, the gift of John Clark the blind organist of the church. In 1852 Henry Elliston (organist at Leamington) extended the Swell from fº to f³ (37 notes) to cº to f³ (42 notes) and the Pedals to GG/AA to cº (17 notes). In 1896 the organ was restored with C compasses, and in 1978 it was restored to playing condition by John Bowen and Robert Shaftoe. In 2009 it was restored to its original stoplist, including GG compass and Choir and Swell reeds (which had been stored under the organ and in the sexton’s hut in the churchyard). George Cooper (1793-1843) writing in The Christian Remembrancer thought the organ “generally esteemed the worst instrument of its maker: the tone being extremely harsh and unmusical. It is quantity without quality; and possesses what organ-builders term a cast-iron tone.” In The Musical World he described it as “a source of unceasing annoyance to the choir and organists.” Cooper seems to have had something against Elliot, but there are indications of hasty work in the organ, as if using parts made for another organ assembled rapidly for a royal emergency, perhaps George III’s lying in state since he died a year later. On the other hand, nobody could accuse the organ of having a ‘cast-iron tone’. It is quite restrained and sweet, though still with some of the brightness of 18th century organs. It is probably the earliest organ surviving in Great Britain with all its parts intact – nothing had to be reconstructed, apart from filling in a few gaps in the pipework, especially in the reeds, and supplying some of the GG-BB pipes. The reports written during the project and other pictures and information are to be found on the church’s website at www.crick.org.uk/organrestoration/index.html. There is a report on the organ in preparation, available on CD. Pitch: A437Hz at 18ºC (revealed by the front pipes – the organ could not be any flatter). The tuning is a modified 1/5th comma tuning, with the wolf spread to make all keys more or less usable (though there is a noticeable difference between the good meantone keys and the bad keys). It is the tuning that was discovered more or less undisturbed on the Swell pipework of the 1829 J.C.Bishop organ at St James Bermondsey.